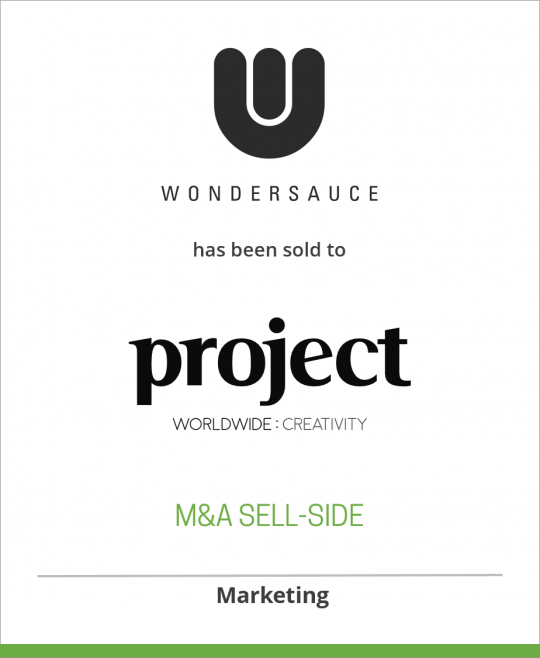 DeSilva+Phillips client, Wondersauce, was acquired by Project Worldwide (“Project”). The acquisition makes Wondersauce the 14th agency to join the Project company portfolio. Terms of the deal were not disclosed. Founded in 2011, Wondersauce is a leading New York-based, strategic and creative digital agency. Wondersauce’s addition to the Project network will bring a wealth of e-commerce and marketing activation expertise, as well as emerging digital media buying capabilities. The 80-person Wondersauce – which has a second location in Columbus, OH – has worked with Nike, L’Oréal, and Stella Artois, and currently counts Carlson Rezidor Hotel Group, Federal-Mogul Motorparts, Bloomin’ Brands, and Google among its clients. Founders John Sampogna and Eric Mayville will serve as co-CEOs and join Project’s strategic leadership team. Co-founder Seth Klassen will become co-chief creative officer with Brett Waszkelewicz, who is a partner and former executive creative director. The agency will continue to operate under its name.